(Nanowerk News) Researchers from the Eindhoven University of Technology and the University of Ulm have made the first high-resolution 3D images of the inside of a polymer solar cell. This gives them important new insights in the nanoscale structure of polymer solar cells and its effect on the performance. The findings were published online in Nature Materials on Sunday 13 September. The investigations shed new light on the operational principles of polymer solar cells. These solar cells do not have the high efficiencies of their silicon counterparts yet. Polymer cells, however, can be printed in roll-to-roll processes, at very high speeds, which makes the technology potentially very cost-effective. Added to that, polymer cells are flexible and lightweight, and therefore suitable to be used on vehicles or clothing or to be incorporated in the design of objects. In these hybrid solar cells, a mixture of two different materials, a polymer and a metal oxide are used to create charges at their interface when the mixture is illuminated by the sun. The degree of mixing of the two materials is essential for its efficiency. Intimate mixing enhances the area of the interface where charges are formed but at the same time obstructs charge transport because it leads to long and winding roads for the charges to travel. Larger domains do exactly the opposite. The vastly different chemical nature of polymers and metal oxides generally makes it very difficult to control the nanoscale structure. The Eindhoven researchers have been able to largely circumvent this problem by using a precursor compound that mixes with the polymer and is only converted into the metal oxide after it is incorporated in the photoactive layer. This allows better mixing and enables extracting up to 50% of the absorbed photons as charges in an external circuit. The importance of the degree of mixing was clearly demonstrated by visualization of the structure of these blends in three dimensions. 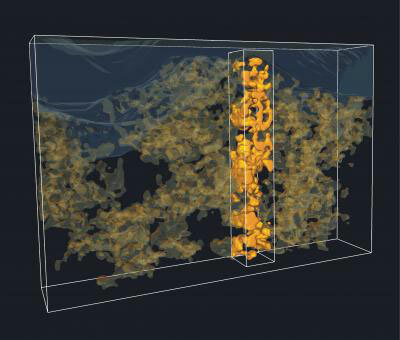 Traditionally such visualization has been extremely challenging, but by using 3D electron tomography, the team has been able to resolve the mixing with unprecedented detail on a nanoscale. From these images the researchers at the Institute of Stochastics in Ulm have been able to extract typical distances between the two components, relating to the efficiency of charge generation, and analyze the percolation pathways, that is, how much of each component is connected to the electrode. These quantitative analyses of the structure matched perfectly with the observed performance of the solar cells in sunlight. Even though these hybrid polymer solar cells are among the most efficient reported to date for this class, their power conversion efficiency of 2% in sunlight must be enhanced to make them really useful. This will be realized by improving the control over the morphology of the photoactive blend, for example by creating polymers that can interact with the metal oxide and by developing polymers or molecules that absorb a larger part of the solar spectrum. At such point, the intrinsic advantages of hybrid polymer solar cells in terms of low cost and thermal stability of the nanoscale structure could be fully exploited. The publication "The effect of three-dimensional morphology on the efficiency of hybrid polymer solar cells", by Stefan Oosterhout et al. can be found at DOI 10.1038/NMAT2533.